Corn is a member of the huge grass family, a sister of sugarcane and sorghum. It was named Zea mays by the botanist Carl von Linne (a.k.a. Linnaeus)—the “mays” coming from the Native American name “mais”. In the United States we call the crop “corn,” but internationally it is commonly known as “maize.” Unlike rice, sugarcane, sorghum, and wheat, maize is a truly American crop. Yet, it shares at least 98 percent of the genes of those related grasses, which did not evolve in the Americas. All early American civilizations were built on maize as the primary energy food. This yellow super sweet has become an open pollinated "heirloom" favorite of growers around the world. In Hawaii it was selected for it's resistance to tropical diseases and the cob destroying grubs as well as its productivity. Seedlings should emerge within a week andbe knee-high in a month. Plant two to three seeds per hill spaced l foot apart in rows spaced 2 feet apart. Be sure to thin the plants four weeks after planting to leave one vigorous plant per hill. A compact square or circular planting design in the home garden ensures better pollination than does a single, long row. The best recommendation is to plant a minimum of four rows about 8 feet long rather than one or two long rows. Hawaii’s supersweets are delicious uncooked. 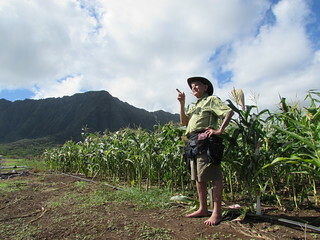 Serious growers are referred to the CTAHR publication Corn Production in the Tropics—The Hawai‘i Experience. (www.ctahr.hawaii.edu/oc/freepubs/pdf/corn03.pdf; or www.ctahr.hawaii.edu/oc/forsale/cornflier.pdf).